Safety is essential when towing your boat on the road, as Rupert Holmes and Lenny Rudow explain. 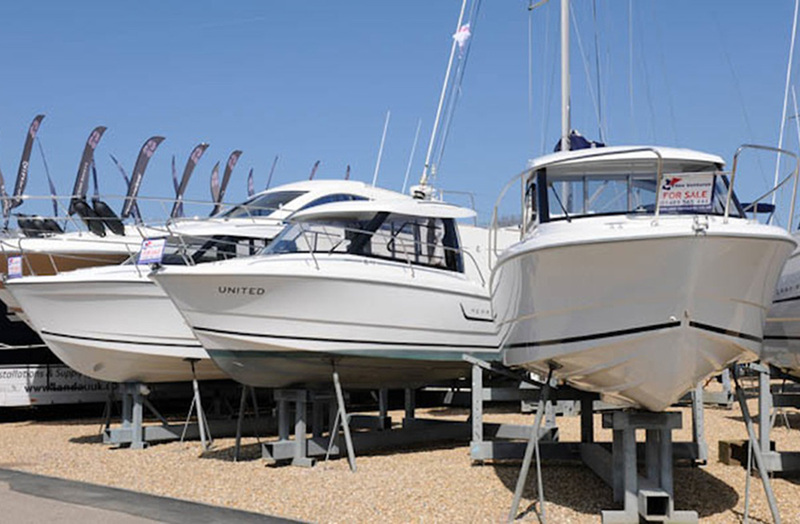 Depending on their weight and beam it’s possible to tow boats of up to around 30ft length and three tonnes displacement with your own vehicle. However, even with a lightweight dinghy it’s easy to fall foul of the law. 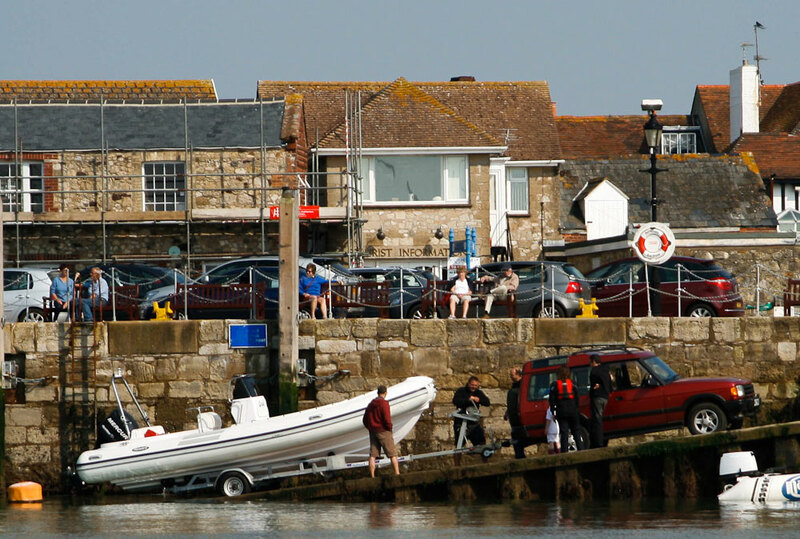 Here’s a run down of the most important points for those towing a boat in the UK, plus some top tips for safe boat towing. If possible, choose a break-back trailer where the hubs don’t need to be immersed to launch the boat. UK law doesn’t specify a relationship between the weight of a towing vehicle and the weight of a trailer with a maximum laden weight under 3,500kg. However manufacturers of cars and other vehicles designed for carrying fewer than eight passengers specify a maximum permissible trailer weight. This usually assumes the towing vehicle is carrying only the driver and a full tank of fuel. A Gross Train Weight may also be given, in which case neither the overall weight of the car plus trailer combination, nor the towing weight, should be exceeded. The RAC, however, recommends lower limits, advising drivers not to tow a weight greater than 85 per cent of the kerb weight of their towing vehicles, which is normally significantly lower than manufacturers’ maximum figures. The risk of towing a greater weight is the trailer is more likely to take control, causing either snaking or jack-knifing. If snaking occurs, ease off the accelerator (or brake) until the trailer stabilises. Jack-knifing is usually the result of braking too hard while turning a corner. In practical terms it can be very difficult to figure out the exact weight of a boat a trailer combination – many craft were significantly heavier than the boat builder’s figures when then left the factory. Also don’t forget to factor in additional weight of the trailer, spares, tools, extras such as ground tackle, outboard engines and your own personal kit – these can easily add up to 50 per cent of the weight of the boat. If you are at all unsure of the overall weight, take the outfit to your nearest public weighbridge – the charge for this is usually less than £10. These 29ft Dragon keelboats are routinely towed to regattas throughout Europe and Scandinavia. All drivers who passed a car test before 1 January 1997 are entitled to drive a vehicle and trailer combination up to 8.25 tonnes maximum authorised mass (MAM). However, drivers who passed a car (Category B) test on or after 1 January 1997 are much more restricted as to what they can tow. Vehicles up to 3500kg MAM may be coupled with a trailer up to 750kg MAM. 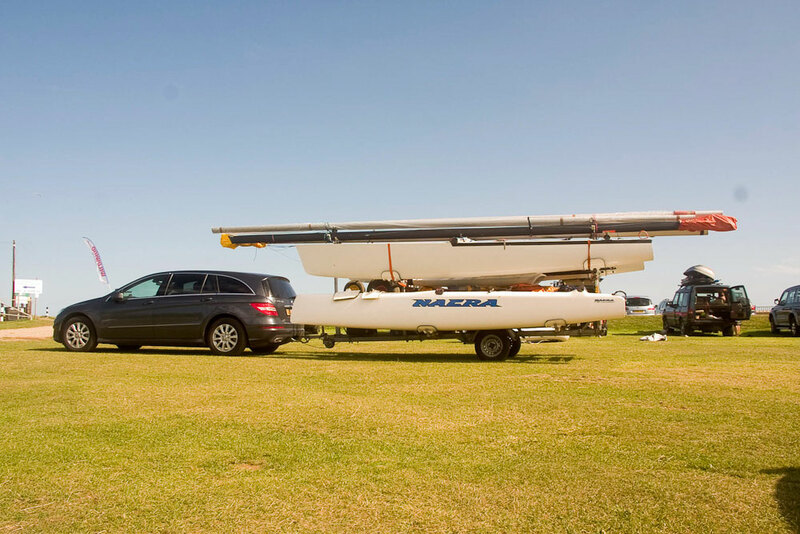 A trailer over 750kg MAM can also be towed if the MAM of the trailer is less than the unladen weight of the towing vehicle, and the combination does not exceed 3.5 tonnes MAM. Note this refers to the maximum load the trailer is designed to carry, not the load it is actually carrying. When towing 30 and 40mph speed limits apply to vehicles towing a trailer, but on single-carriageway roads the 60mph national speed limit is reduced to 50mph. On motorways and dual-carriageways the 70mph limit is reduced to 60mph. Vehicles towing a trailer cannot use the fast (outside) lane of a three-lane motorway. Boat trailers are infrequently used, which makes them prone to a number of problems that can have devastating safety implications. These are compounded if the trailer is immersed in water to launch or recover the boat. Immersion in salt will affect wheel bearings, braking systems and accelerate corrosion of the chassis. Washing thoroughly with fresh water will reduce the harmful effects of salt water, but will not reduce the need for frequent maintenance and servicing of the trailer. Trailer tyres should have at least 1.6mm of tread depth across three-quarters of the tyre width, must be free of deep cuts and bulges and must be maintained at the right pressure. Note that many trailer tyres don’t cover enough mileage to wear out before their 5-8 year lifespan has been exceeded. To avoid brakes seizing, don’t leave the trailer parked for a long period with the handbrake on – chock the wheels instead. Make sure the trailer is serviced regularly – at least annually – and more frequently if it is regularly immersed in water or covers a high mileage. Wheel bearings are often a problem if the hubs have been immersed in water – avoid launching when the bearings are hot. If possible, wash the whole trailer, and especially the wheel hubs, with fresh water after immersion in the sea. The sealed bearings fitted to modern trailers are more resistant to water ingress, but are not impervious to it and cannot be stripped, cleaned and regreased in the way older taper bearings can. Standard, basic trailer lighting boards are suitable only for trailers/loads up to 1.3m wide. 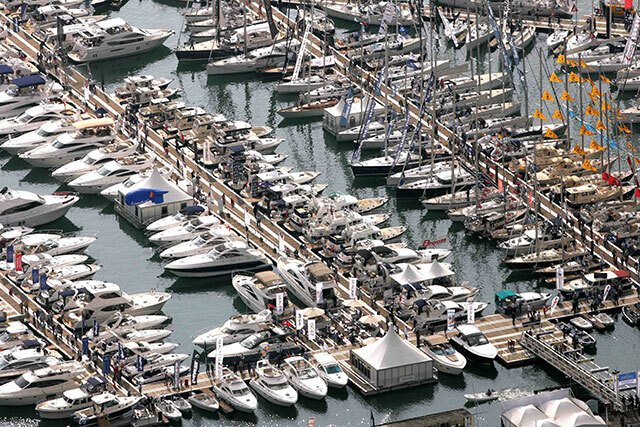 If your boat is wider than this you will need a lighting board that includes a fog light. Wider loads also need additional reflectors and a larger lighting board. It’s also worth noting that trailer lights are notoriously unreliable – check them at every opportunity. 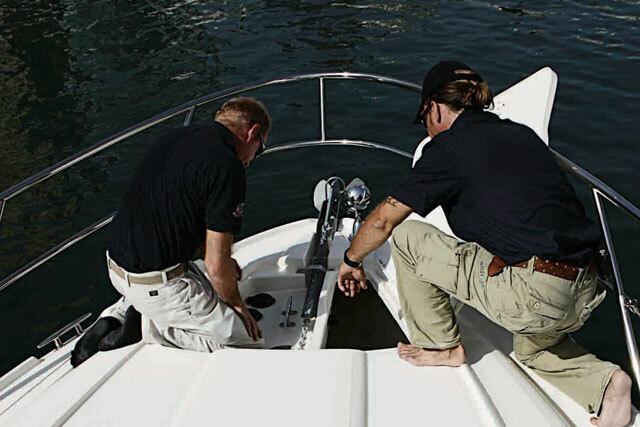 Tie-downs are also vital to keep the boat in position, both over bumps and in the event of an accident. Ratchet straps are quick to rig and readily available, but don’t fall into the trap of buying a set with insufficient strength – the safe working load needs to be able to support the dynamic loads involved. The breakaway cable or secondary coupling are vital safety items that come into play if the trailer becomes separated from the tow vehicle, yet are frequently defective, or completely absent. Secondary couplings provide residual steering for an unbraked trailer in the event of an unplanned uncoupling. They should be attached to a point on the towing vehicle other than the tow bar and be short enough to prevent the front of the trailer touching the ground, but not so short as to interfere with cornering in normal use. Braked trailers must be fitted with a breakaway cable that operates the trailer’s handbrake in the event of it becoming uncoupled from the towing vehicle. Again this is attached to a point on the towing vehicle other than the tow bar. Nose weight – to ensure safe handling characteristics, especially avoiding snaking, vehicle and trailer manufacturers specify the weight a trailer should impose on a tow bar. 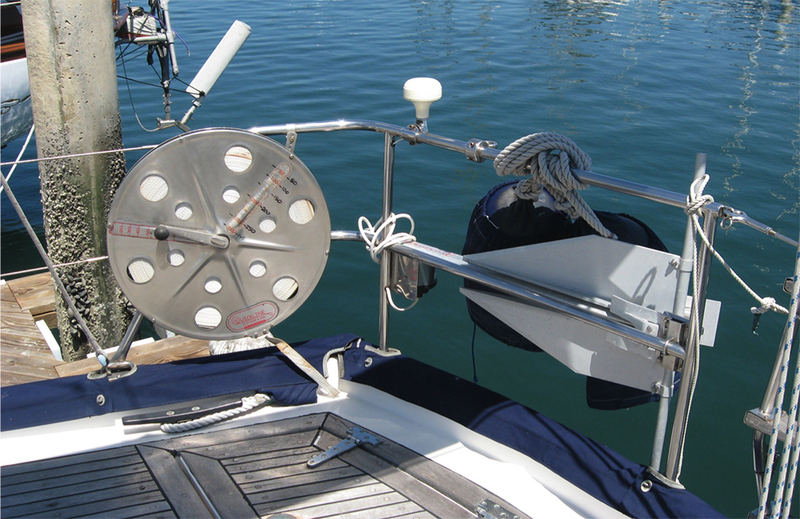 This is generally between 50-100kg, unless the trailer is very light – for example in the case of a small dinghy. Nose weight can be checked using a spring balance, or by resting the trailer coupling on bathroom scales, using wooden chocks to keep the trailer level. Trailers with a maximum authorised mass of less than 750kg do not need to be fitted with a braking system. However, you can only tow an unbraked trailer if its maximum authorised mass (MAM) is less than half the towing vehicle’s kerb weight. This may give a figure lower than many drivers might expect – for instance medium size family saloon with a kerb weight of 1340kg cannot be used to tow an unbraked trailer over 670kg. 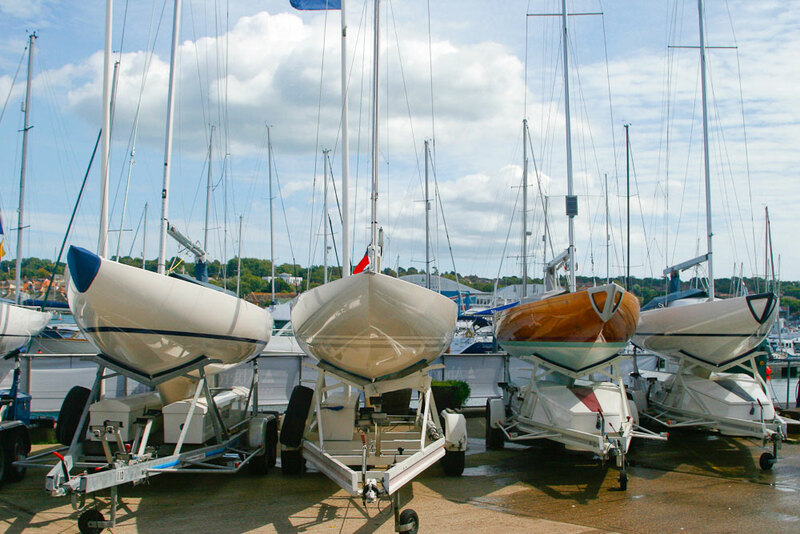 It’s vital to ensure the boat is properly strapped down to the trailer and that overhangs, whether to the side, front or back, are properly marked. A load on a trailer may project from the side of the trailer up to 305mm on either side, providing the total width does not exceed 2.9m. A load may overhang the rear of the trailer by up to 3.05m. Overhangs of 1-2m should be clearly marked by a cloth or similar; marker boards as described in the Highway Code must be fitted and illuminated at night for overhangs between 2-3.05m. Extension door/wing mirrors of the type used for towing caravans may be needed if the boat is wider than the tow car – failure to fit them can cost a £1,000 fine or three points on your license. There is no legal restriction on height, although if a trailer or load exceeds 3.0m then the overall height should be displayed where it can be easily seen by the driver. 1. Before you hit the road make a full pre-tow safety inspection of your rig. a. Check to make sure the tow vehicle and trailer are properly mated; this includes looking at the light plug, the hitch, the brake safety cable, and the safety cables or chains. b. Check the bow strap and boat safety chain to make sure they’re also secure. c. Step aboard the boat, and look around for anything that’s not fully secured. Life jackets, empty coolers, and loose clothing are all items that can blow or bounce out of the boat when trailering. 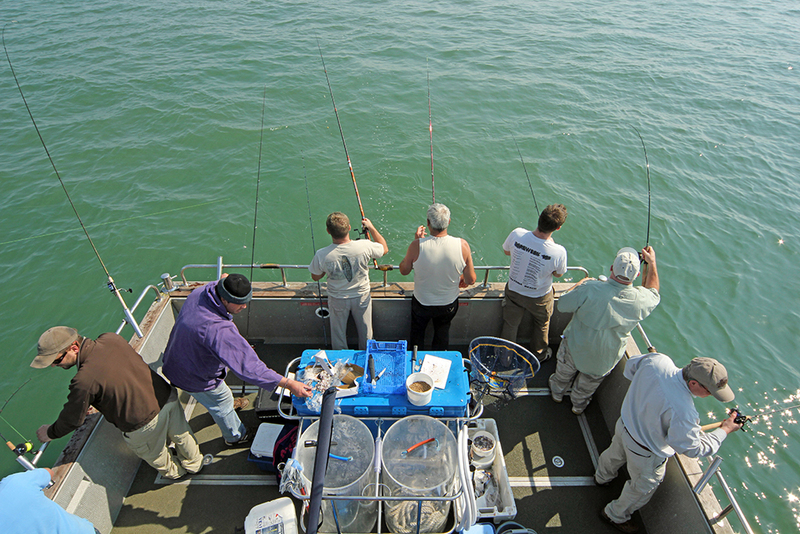 d. If there’s any heavy gear aboard, centre it in the boat, as close as possible to directly above the trailer’s axle(s). 2. Nose weight should be about 10 to 15 per cent of your load, but must not exceed the manufacturer's stated maximum figure for your vehicle. If the nose weight is not correct the trailer might sway or start to snake. Swaying is extremely dangerous—if you detect sway in your rig, slow down immediately, pull over, and adjust your load. 3. Check your load distribution. Make sure your towing vehicle’s load is level and even, too. 4. Complete a final light check before pulling out onto the road. Be sure brake, running, tail, and indicator lights are all working properly. 5. Take turns as wide as possible to avoid clipping a curb or other obstructions. When multiple turn lanes are available, use the outside lane. 6. Leave extra following room. That extra weight you’re hauling can increase stopping distance significantly. 7. If a gust of wind pushes your rig sideways, take your foot off the accelerator but do not step on the brakes, to reduce the effect. 8. Check your hubs. When you arrive at the slipway (or if you stop along the way) walk back to the trailer hubs and feel them. They should be cool to the touch. If they’re hot, your bearings aren’t functioning properly—have them serviced immediately, or you could experience bearing failure while rolling down the road. 9. Don’t remove the winch strap and safety chain until you’ve backed the boat down into the water. If you remove the strap and chain too early, the boat can slide off and smash onto the boat ramp! 10. 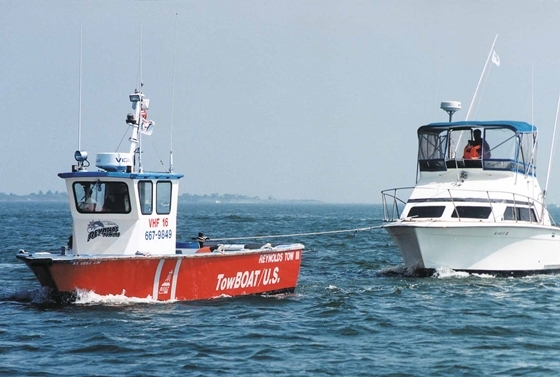 Tow your boat with a competent (and legal) tow vehicle. The trailer towing laws in the UK are explained here while the EU towing laws are explained here. Power is, of course, important, as is the weight of the vehicle, but look out for vehicles with dedicated towing features (some of which are explained in the video below), including 'sway control', which applies individual wheel brakes and/or reduces power to the wheels to reduce sway automatically. Automatic load-leveling is another sweet feature that is able to adjust the truck to account for load, and optimum mileage. Hill start assistance features are also available, which are designed to prevent your rig from rolling backwards as you move your foot from the brake pedal to the accelerator when starting up from a dead-stop on a steep hill or boat ramp. See more in the video below. 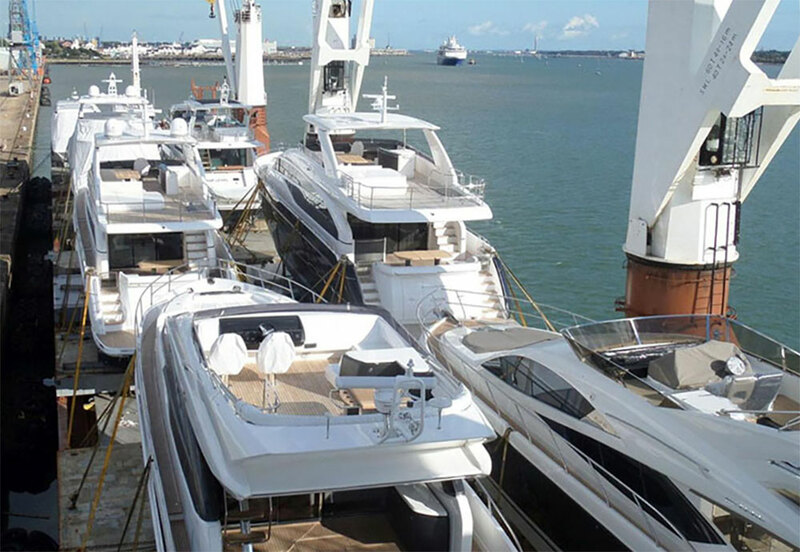 If your boat is too large to be towed on a road trailer, or if this option doesn't appeal, it's possible to use a specialist boat haulage company or transport it by ship. Alternatively using a delivery crew to deliver it by sea may be a better option for you.